October’s arrived and to chase away the cool misty mornings comes an exciting month of cruise news and all things cruise related. As the evenings draw in ‘Plan a Cruise Month’ is the perfect time to think about booking a cruise and taking advantage of some fabulous offers and promotions which the cruise lines are offering throughout October. 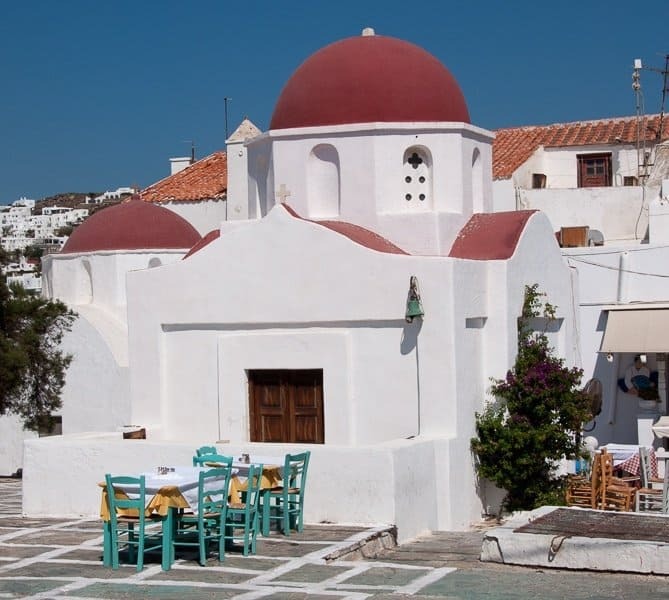 Mykonos Old Town is just a ten-minute stroll from the cruise dock. If you’re in the mood for exploring under your own steam there’s plenty to see within walking distance of the port. If you’ve only got one day in Mykonos you can take in the ancient history of nearby Delos and still see the beautiful sights of Mykonos with time to enjoy its windmills, pretty alleyways, shopping, beaches and good food. Here’s how to spend your time in Mykonos. As you approach the town you’ll skirt a bay of clear turquoise water lined with restaurants, bars and shops. Fishing boats back from the day’s catch are moored in the shallows and whitewashed houses tumble down the hillside like little boxes. 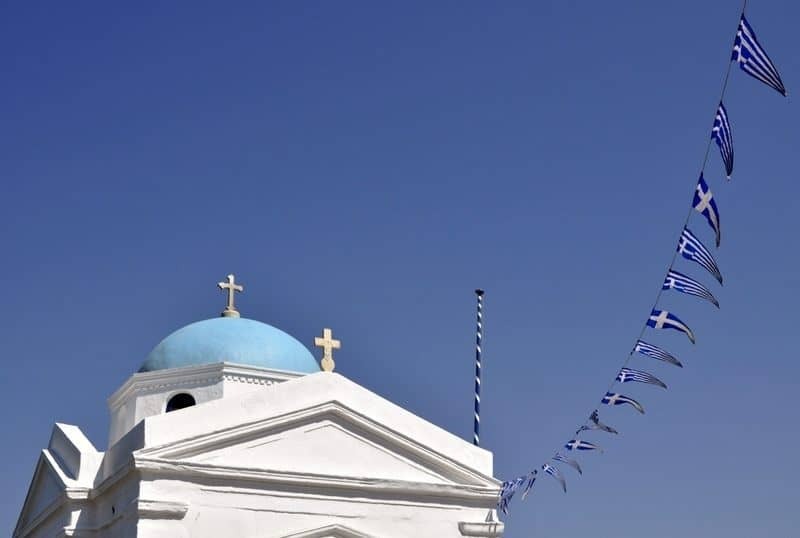 Agios Nikolaos Church, the tiniest of blue-domed churches, sits almost on the water it’s flags fluttering on the warm breeze. Its pristine white-washed walls are the perfect contrast to the cobalt-blue of the sky. 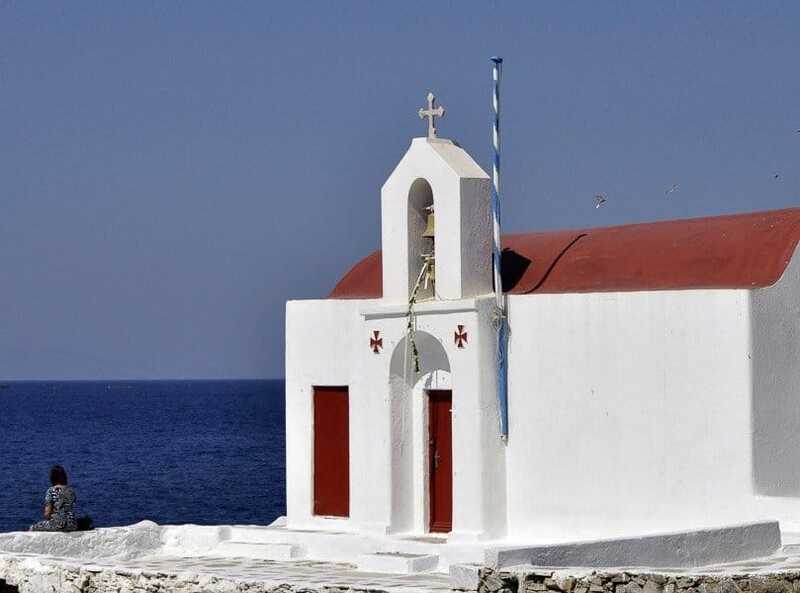 Carry on past the bay and up the hill and you’ll come to the most famous and most photographed of Mykonos’ churches. Paraportiani Church is a small pyramid-shaped structure made up of four churches built asymmetrically together in varying architectural styles. This pretty church has a bell-tower, a dome and is crowned with crucifixes which stand out against its backdrop of never-ending ocean and sky. 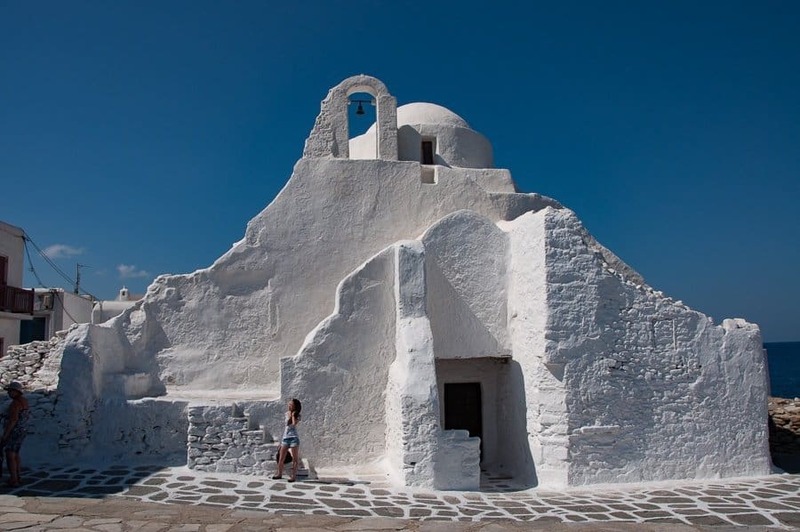 If you’ve only got one day in Mykonos then don’t miss this gorgeous little church. Keep walking away from the port and you’ll arrive at Little Venice. The waterfront is lined with rows of 18th century fishing houses with wooden balconies that hang out over the sea. The houses, with direct access to the sea, originally belonged to shipping merchants but now house a lively area of cafes, restaurants, bars and shops. Tables are set up all along the water’s edge for outdoor dining with sultry sunset views. If you’re ready for a cool drink find yourself a bar with a shaded balcony looking directly over the water and soak up the scenery. I made myself at home in Katerina’s bar and spent a pleasant half hour chilling on the balcony as the sea lapped below me. Refreshed and rested from your stop in Little Venice you’re now ready for the short walk up the hill to the iconic Mykonos Windmills. This is one of my favourite things to do in Mykonos. The Kato Mili which stand sentry at the top of the hill were built by the Venetians in the 16th century. Originally the straw-topped mills with wooden sails were used for milling flour. Nowadays one houses a museum and another can be rented for short stays. There are around a dozen windmills on the island but these are the most famous. If you want to beat the crowds and find a quiet beach with a typical Greek taverna I know just the place. 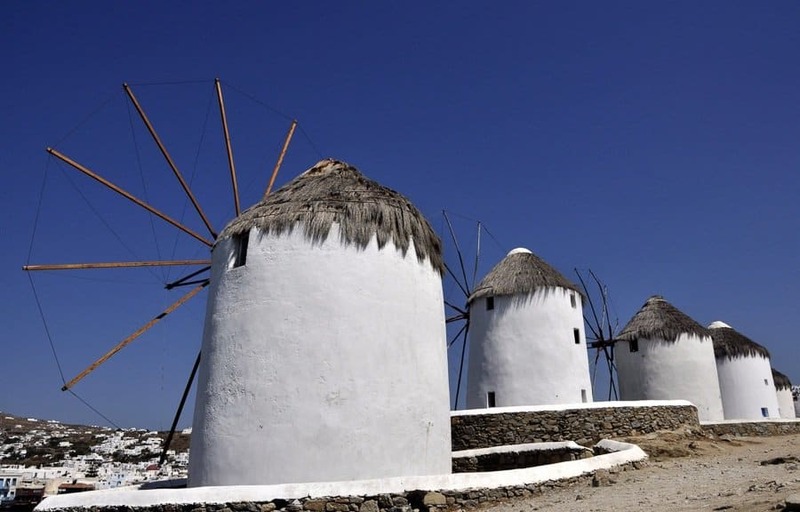 Keep going past the windmills and meander your way down to the golden sand of one of the best beaches in Mykonos. Megali Ammos beach is a well-kept secret (until now!). 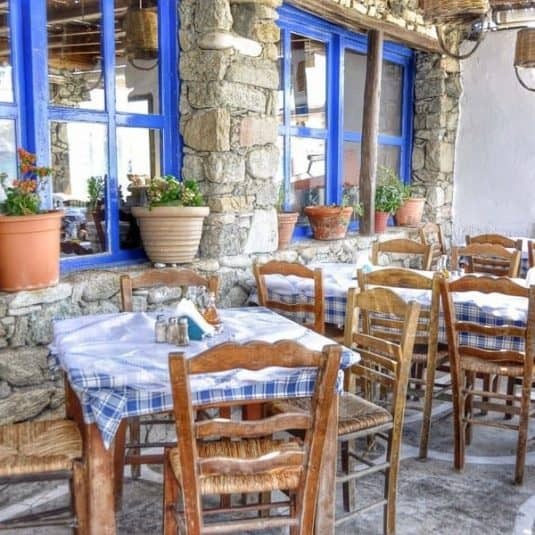 It’s just a ten-minute walk from the windmills and Joanna’s Niko’s Place Taverna serves up delicious Greek fare with a side of traditional Greek music. 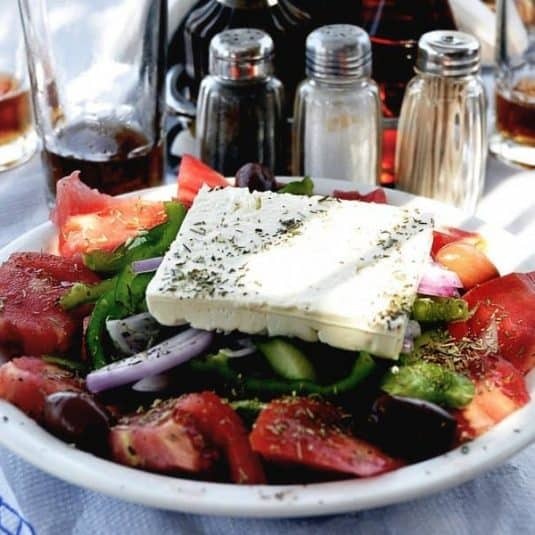 Think crisp Greek salads, fresh fish, baked feta, fried zucchini, tzatziki, taramasalata and warmed pittas for dipping. After all that good food take time to relax on the beach for an hour before heading back to explore the alleyways in Mykonos Town. 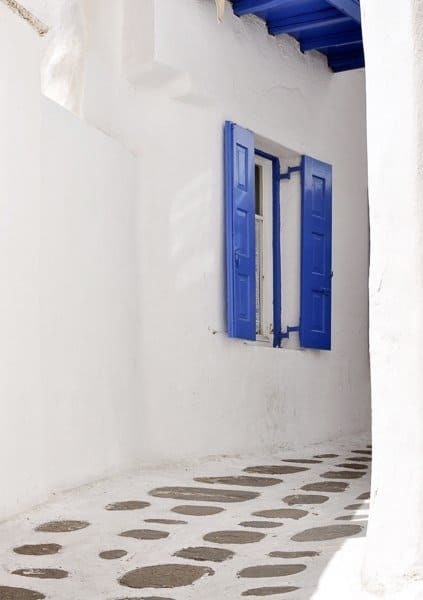 Make sure you leave at least an hour to wander the winding white-washed alleyways and back-streets of Mykonos. You’ll find art galleries, boutiques selling artisan jewellery and souvenir stalls. Narrow lanes festooned with vibrant Bougainvillea lead to hidden churches. Cats laze in front of azure-blue doorways soaking up the endless sunshine. A day spent in Mykonos slows the pace as you adjust to its laid-back Greek vibe, take time to chill and allow yourself to fall under its spell. 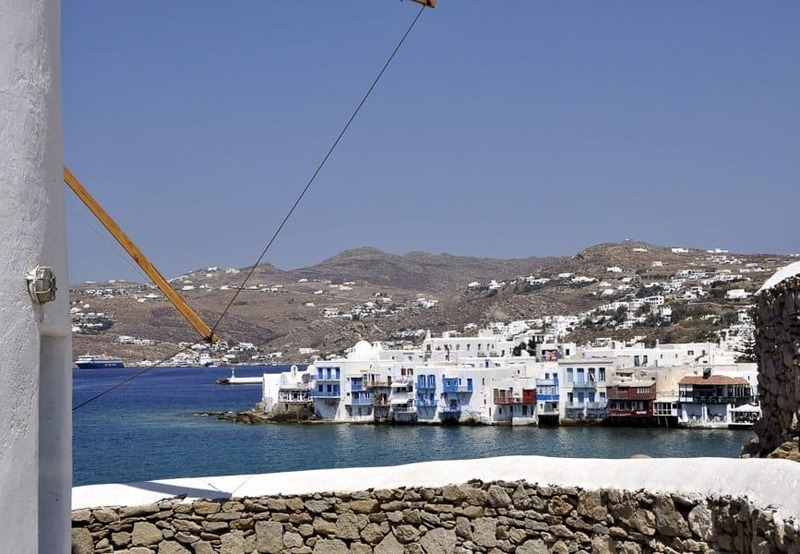 A Mykonos day trip is a must-do on your Greek island cruise. 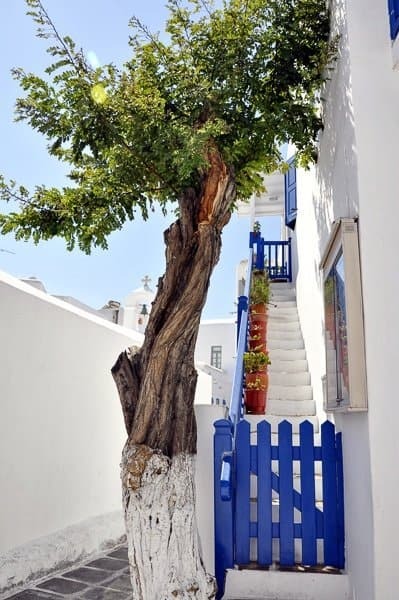 You could spend your time exploring Mykonos old town or choose from Mykonos excursions and see more of the island. 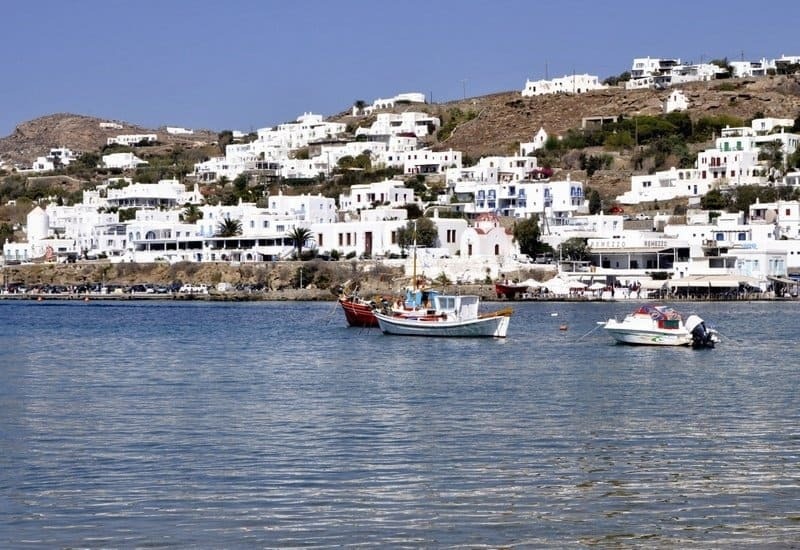 Mykonos boat trips are available to spend time enjoying the water. You could also take the Mykonos to Delos boat and visit the nearby ‘Isle of Light’. 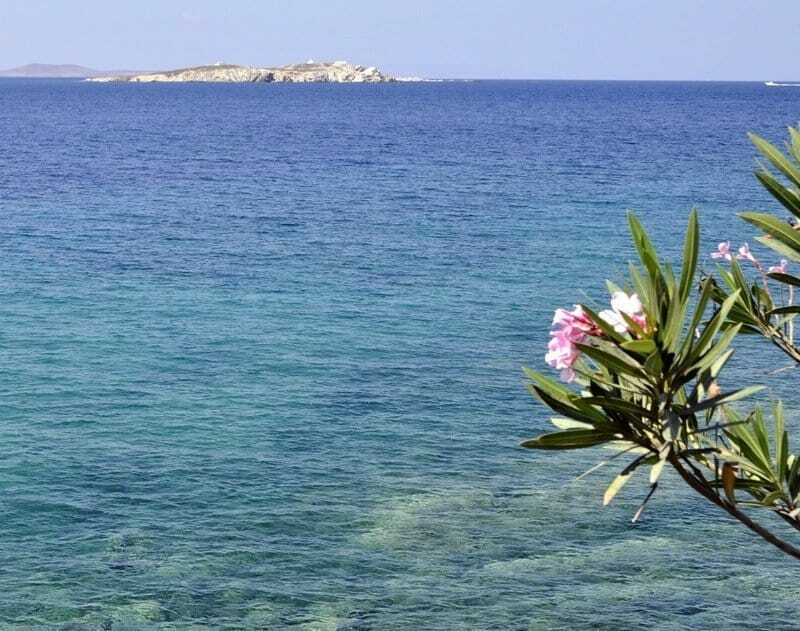 The tiny island is just 25 minutes by boat from Mykonos and is a UNESCO World Heritage site peppered with old statues, sprawling ruins and an ancient shrine. 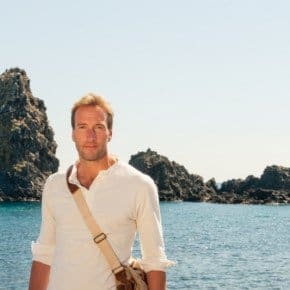 I hope you can see why I loved the island and that this article has given you some ideas for what to do in Mykonos. If you’re thinking of booking a cruise visit www.cruiseexperts.org for information, guides, tips and cruise inspiration. Find them on Instagram and Twitter and look out for our international tweet up on Wednesday 11 October where I’ll be tweeting away. You can also join in with #CruiseMonth until the end of October. It’s been years since I visited Mykonos. I loved all the houses, the blue skies and beaches. I spent a day on Paradise beach which was like a club with blaring music the whole day. Won’t be going back there in a hurry! Ha – I used to love a clubby style beach but not so much since I hit 50! The trouble with Mykonos is that the cruise ships bring in too many day visitors and the place becomes unpleasantly crowded and expensive. Best to head for a smaller island in my opinion! This post was about what to see on the island when you’re visiting from a cruise….! It’s a lifetime since I was on Mykonos, but it looks beautiful as ever, Suze. I love the Greek islands – all beautiful! You had already got me swooning at Mykonos a while back with one of your posts & now you’ve gone and done it again Suzanne! I’d previously always heard of it being quite a party island & whilst I’m game for a party, it’s nice to hear its charm extends beyond that! What an amazing splash of blue and white on my grey autumn Sunday! Loved reading this post and now you really made me want to go on a cruise in the sun. 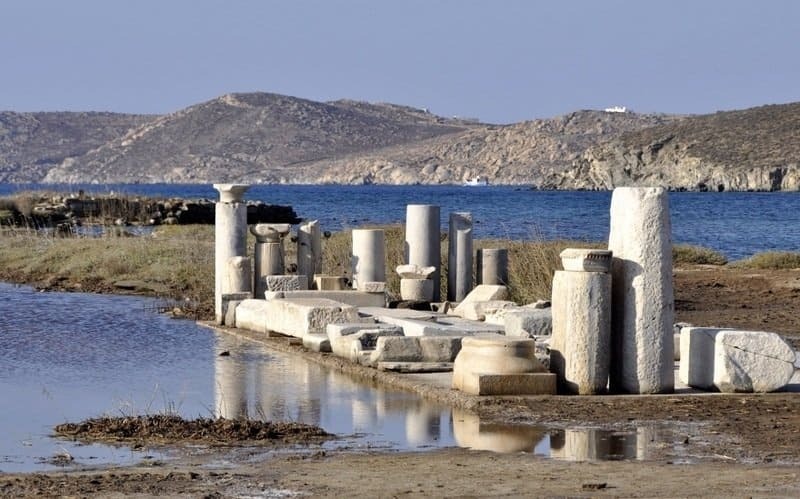 I would particularly love to see Delos, for its cultural significance, but I had never seen a photo of it – thank you for showing it to me, it’s as beautiful as I thought it would be! I’d never heard of Plan a Cruise Month. It would seem to make sense as I’ve had loads of cruise related emails lately. What a beautiful place to be planning, every photo is just picture perfect. Love Greece, all of it, not just the islands. I love Greece too; the islands, the mainland, the people and the amazing food! I have been wanting to go to Greece for so long. A cruise through this area would be so beautiful. A cruise is a great way to have a taste of multiple destinations and then you can go back and explore in the depth the ones that really appeal. reading this has taken me back to my 20s when I used to spend the summers working on the Greek island of Paros. I only spent a couple of weeks on Mykanos but I remember it as being beautiful. 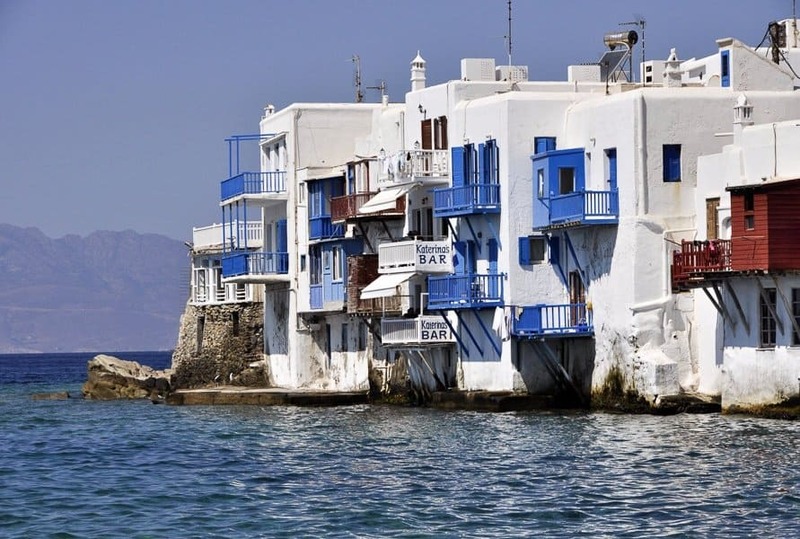 I love the white houses against the deep blue sea, just beautiful! How wonderful to have spent your summers in Paros. The Greek islands really are a special part of the world. Mykonos looks simply stunning and I wish I could take a cruise there! The blue buildings remind me of India’s Blue City, Jodhpur. But having the Mediterranean Sea right there would be much nicer than Rajasthani deserts in the hot months. I especially love that you went through the old city, those are some of my favorites when exploring a city. I haven’t been to Santorini – that’s definitely on my wish list! A Greek island cruise seems one of the best options for a cruise, as each place is gorgeously beautiful, but can be appreciated during a short visit. 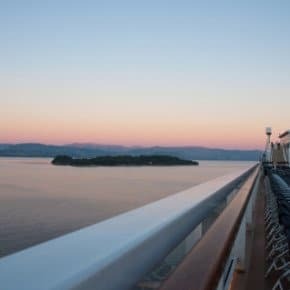 For some cruise itineraries, I find myself thinking I would be shortchanging every destination we visit, but I think a Greek island cruise sounds perfect! I am in love with Mykonos and who wouldn’t be! It is so dreamy 🙂 Although I’m not sure if October is a good month to go here, it gets a bit too chilly to swim in the waters and also, the vibe, which is usually there during summer, the nightlife and the amazing parties, will not be there during October. Such a pity, it is a lovely little island to explore in a day! I’ve never been on a cruise but I’m really interested in it. Especially a Mediterranean cruise. Mykonos is such a photogenic place. I’d love to visit it!